The Creative Mind Behind Annihilation Says Alex Garland's Adaptation Is "Mind-Blowing" And "Surreal"
For the uninitiated, the novel largely takes place in a preternatural crop of land known as Area X. Located in some undisclosed place in rural America, over the years Area X has gained notoriety for pushing its human visitors to the brink of insanity – so much so that, by the time Annihilation begins, a total of 11 expeditions have succumbed to its mysterious effects, either through mass suicide or inexplicable bouts with cancer. Now, it’s time for the 12th expedition to explore Area X and return with samples – or die trying, it seems. That is, in a nutshell, the bones of Jeff Vandermeer’s Annihilation, so it’s small wonder why sci-fi fans are excited for its upcoming transition to the big screen. Natalie Portman, Jennifer Jason Leigh, Tessa Thompson, Gina Rodriguez, and Star Wars: The Last Jedi‘s Oscar Isaac have all signed on to star, with Alex Garland calling the shots from behind the lens. As the writer-director behind the rather excellent Ex Machina, news that Garland is attached at the helm is exciting in and of itself, and while it’s almost inevitable that the film version of Vandermeer’s novel will be somewhat different to the source material, the author himself has now weighed in to say that Alex Garland is rustling up a “mind-blowing” and “surreal” ride in Annihilation. While appearing on The Watch Podcast (via Collider), Jeff Vandermeer showered praise on Garland’s filmmaking prowess. The first thing I realized is that even though Alex Garland says he’s not an auteur, he is an auteur. So my expectation was to not have anything to do with the movie and that’s the actual fact. He wrote the script and he was kind enough to keep me in the loop during every part of the process, but that wasn’t for me to put my two cents in, basically. It was just so I would know what was going on. It’s actually more surreal than the novel. There are a couple places where I was like, ‘I might need an anchor here.’ The ending is so mind-blowing and in some ways different from the book that it seems to be the kind of ending that, like 2001 or something like that, people will be talking about around the watercooler for years… Visually, it’s amazing. I must say that and that’s all I probably should say. More surreal than the mind-bending novel on which it’s based? Take our money, Paramount. Take it all right now. In all seriousness, though, the studio has slated Annihilation for a release in 2018, and though the prolonged wait is a little frustrating, in a follow-up post via Facebook, Jeff Vandermeer assured fans that the end result will be an “extremely beautiful [and] extremely horrific” experience. I’m allowed to say about it or not say about it, so I’ll keep it simple…I’m still composing my thoughts and feelings about it. I can tell you it’s mind-blowing, surreal, extremely beautiful, extremely horrific, and it was so tense that our bodies felt sore and beat-up afterwards. 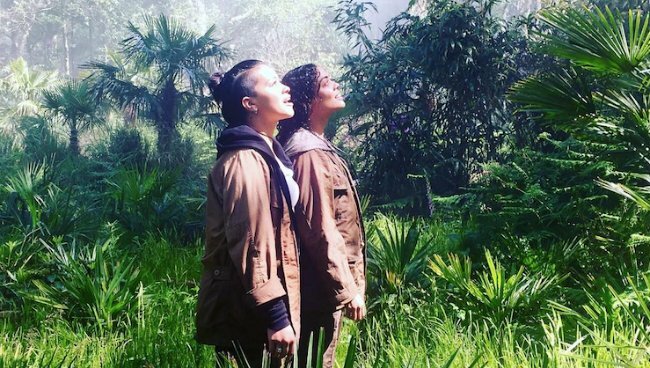 Annihilation is expected to launch sometime in 2018.